Three graduate students have been awarded the Yan Huo *94 Graduate Fellowship in Electrical Engineering: Yushan Liu, advised by Prateek Mittal, Prashanth Venkataram, advised by Alejandro Rodriguez, and Ross Kerner, advised by Barry Rand. The fellowship is for the 2017 - 2018 academic year and is used to support post-general exam PhD students. Yushan earned her Bachelor's degree at Shanghai Jiao Tong University. Yushan is broadly interested in network privacy and security, trustworthy social networks, data privacy, and machine learning. Recently, she has been working on projects on enhancing the privacy and security in the anonymous communication networks and social network based systems. 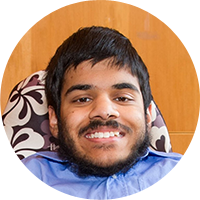 Prashanth attended MIT, majoring in physics and minoring in economics. Since coming to Princeton University, he has been interested in theoretically and computationally modeling fluctuational electromagnetic interactions at the nanoscale, including van der Waals or Casimir interactions as well as heat transfer, in which the material properties and shapes of bodies simultaneously at atomic and much larger scales matter quite a bit. Outside of research, he enjoys spending time with family & friends, reading, and swimming. Ross earned his undergraduate degree in Materials Science and Engineering with a minor in Chemistry from University of Minnesota in 2013. Ross’s research interests during this time were ensnared by electronic materials which led him to pursue an Electrical Engineering Ph.D. at Princeton University. While at Princeton, he has intersected his two areas of expertise by studying electrochemical reactions occurring in novel optoelectronic devices. This work has led to the identification of several key chemical mechanisms linked to the performance and stability of perovskite solar cells. Addressing these challenges is paramount for the commercialization of the technology. My name is Prashanth Venkataram and I am an Undergraduate from Massachusetts Institute of Technology. I graduated from MIT in 2014. Despite my presence in an electrical engineering department, my undergraduate background, as per my degree and research experiences, has been in physics, specifically in computational nanophotonics. When applying for graduate programs, I looked for departments with professors doing research in such areas, and I found many here working in quantum physics and electrodynamics, which suited me just fine. When I attended the visit days after being offered admission, I was struck not just by the quality of research being done at the department, but also by the myriad opportunities for internal and external collaborations, how the professors really seemed to care about their students' academic and personal well-being, the supportive and caring nature of the graduate students in the department, and the healthy sense of a work-life balance for graduate students. These all sealed the deal for me to join the graduate program in ELE at Princeton, and I've only found these factors to be more true as I have continued my studies here. Since joining, I've worked on the theory and computation of fluctuational electrodynamic phenomena, which considers electromagnetic interactions among various objects arising from atoms that are constantly jiggling around due to quantum and thermal effects. Specifically, I have primarily focused on more accurately describing van der Waals interactions in molecular and larger systems; these are forces that atoms and larger bodies exert on each other due purely to quantum effects, even at zero temperature, and is responsible for the stability of DNA, the potential for nanoscale devices to stick to each other, and geckos' ability to stick to anything without any sort of glue. I also hope to look into other types of fluctuational electrodynamic energy transfer, including heat transfer and fluorescence. I'm not sure of exactly what I want to do after graduating from Princeton, but I would probably like to continue theoretical or computational applied physics research in an academic, industrial, or government setting.